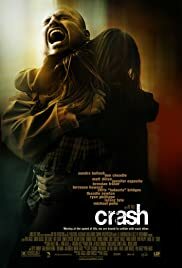 Q: Why wasn't "Crash" up for 2005 film awards (such as the Oscars), when IMDb lists it as a 2004 film? Haggis' directorial debut is a powerful and thought provoking look at a slice of LA life. In some ways, with its multi strands, it reminded me of some of Altman's "Nashville". The film successfully pulls all the strands together to make some pertinent points about different races fearing and misunderstanding each other without resorting to platitude too much.